There’s a reason why millions of hypothyroidism and Hashimoto’s disease sufferers fail to ever get relief from hypothyroid and autoimmune symptoms and feel normal again. The obvious aspects of hypothyroidism that everybody is focusing on is only the tip of the iceberg. However, there are bigger problems related to how your body utilizes thyroid hormones. They are often hidden and result in a broken thyroid hormone pathway. The problem is that you can have enough thyroid hormones in your system supplied from thyroid medication and/or produced by the thyroid gland but often they just cannot get into your cells and don’t create necessary metabolic effect. If you do not know where to start you could get a consultation and/or interpretation of your test results at the True Helath Labs website. One of their doctors can help you to pick the right test(s) for you and supply you with a List of doctors the Labs recommend. Click on the link to read about comprehensive thyroid testing. In fact, most forms of exercise will further damage your thyroid. But there are some very beneficial forms of hypothyroid exercise that have proven that they can be a very effective component of your hypothyroidism treatment plan. 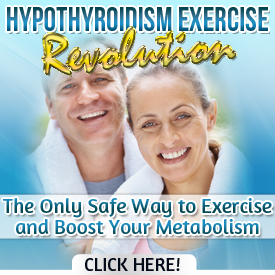 Learn how to exercise with hypothyroidism without damaging your thyroid. Starting a gluten-free diet can be challenging because many foods people eat on a daily basis contain gluten. Check out List of foods that contain gluten to make sure you are making the right food choices. The Paleo Diet is becoming more popular among people with celiac disease, gluten intolerance and food allergies. It’s a good starting point as well as a life-long solution for those with Hashimoto’s, autoimmune diseases and other associated health conditions who would like to successfully control their symptoms and often achieve significant improvements in their health. All recipes are based on fresh whole foods and ingredients and contain No Grains and No other Highly Allergenic Foods. 6. Special Report: The power of phytonutrients and the best foods to eat with highest phytonutrient levels. Video program on how to lose weight with hypothyroidism Fat Is Not Your Fault by Dr Bryan Wash will help you to understand and identify ALL physiological factors that can affect your thyroid function and may prevent you from losing weight. Diabetes, heart attack, stroke, cancer, obesity and other diet-related diseases which were once incorrectly associated with age are affecting people more younger people. All these diseases of modern society begin with what is on our plate. It Does NOT Have to Be this Way! Nutritional transformation program Your Plate, Your Fate created by Kelley Herring and a group of health, fitness and nutrition experts provides you with information and the right tools to make simple dietary changes to support your healthy life style and learn how compounds in food can cause or protect against a disease. 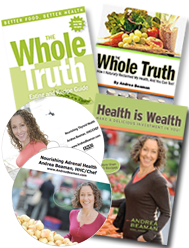 The program includes 10 Part E-book Series, Organic Menu Plans and 3 FREE bonuses. The program is focused on “The Big Five” destructive internal processes such as inflammation, glycation (formation of advanced glycation endproducts) , oxidative stress, nutritional deficiencies and toxification which are the main contributors to the development of all chronic illnesses. Many health books present a lot of information…but are lacking of a good advice. The Your Pale, Your Fate program provides you with hundreds of tips on how you can put prevention into practice.